Concrete is an excellent building material. Man has been using concrete to build all types of structures for many centuries. It has proven to be very durable and very strong in compression. With the invention of reinforced concrete in the mid 1800s, concrete also was found to provide a degree of tensile strength. In 1868, Joseph Monier from France patented the use of reinforced concrete to build pipes and tanks. Since that time, engineers have taken full advantage of reinforced concrete's superior engineering properties and have been using it to build water and wastewater tanks all over the world. Unfortunately, with the introduction of reinforcing steel into concrete, a new problem was created that affected the durability of concrete. When embedded reinforcing steel corrodes, it can cause concrete to crack and spall. These cracks and spalls not only reduce the structural integrity of the concrete, but they also allow deleterious elements to freely enter into the concrete to accelerate the rate of deterioration. Other problems that affect the durability of concrete in water and wastewater tanks include abrasion, chemical attack and freeze-thaw. These destructive forces can significantly reduce the service life of the structure. This article highlights some methods and materials that can be used to protect concrete tanks from the harsh environment in water and wastewater facilities. All concrete deteriorates over time. The rate at which concrete deteriorates is a function of two factors: the quality of the concrete and the environment to which the concrete is subjected. The quality of concrete refers to the properties incorporated into the original concrete mix design such as water/cement ratio, cement type, size and hardness of the aggregate and air entrainment. Quality is also dependent on the construction practices used to place the concrete such as proper consolidation, cover and curing. If the designer and contractor paid attention to these details, then hopefully your concrete is dense, has low permeabilty, is resistant to freeze-thaw damage, and is relatively crack-free. If you have concrete like this, consider yourself lucky but not home free. The second factor affecting the rate of deterioration is the environment. Water and wastewater treatment plants provide a severe environment for concrete. 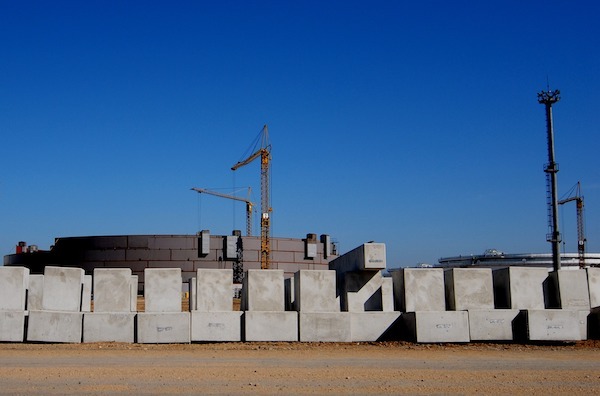 Concrete tanks can be subjected to wet-dry cycling, freeze-thaw cycling, chemical attack and abrasion. Even high quality concrete will deteriorate under these harsh conditions (but at a slower rate than poor quality concrete). For this reason, it is wise to protect concrete, even good quality concrete, to increase durability. The best time to protect concrete is when it is new, before harsh chemicals like acids, salts and sulfates have had a chance to get inside the concrete and cause damage. Unfortunately, there are thousands of concrete tanks that were built in the '70s and '80s that were not adequately protected. As these tanks enter their second and third decade of service, the effects of all those years of unprotected exposure start to become apparent in the form of cracks, spalls and leaks. Once these problems develop, the deterioration of the concrete is accelerated because aggressive substances now have an unobstructed passageway into the concrete. In the rehabilitation process, it is important to first determine why the concrete is deteriorating. Having this information allows you to address the root cause of the problem so that you don't get locked-in to a never-ending cycle of repair. This information is usually obtained from consulting engineers and concrete testing firms who specialize in the evaluation of concrete and who will usually perform a series of field and laboratory testing. From this data, a qualified professional can determine if the problem is freeze-thaw, chemical attack, settlement, abrasion, corrosion, etc. With this information, a protection strategy that addresses the real root cause of deterioration can be developed, instead of just applying a quick-fix solution. This is an extremely important part of the rehabilitation process and should not be compromised. One of the most common root causes of deterioration in concrete tanks is corrosion of the reinforcing steel. In the presence of moisture and oxygen, steel will corrode if not protected. Under normal circumstances, the high alkalinity of new concrete (pH 12­p;13) creates a natural protective oxide layer around the steel known as a passivating layer. As long as this layer stays intact, the steel is protected from corrosion. Unfortunately, dissolved salts in the contained water can penetrate through hardened concrete and destroy this passivating layer. The lower the quality of the concrete, the more permeable the concrete will be thereby allowing water, oxygen and salts to penetrate more easily. This expansion from within creates large tensile forces within the concrete. Since concrete is relatively weak in tension, the concrete cracks to relieve the tensile stresses. Once the concrete cracks, water, oxygen and aggressive chemicals can freely enter the concrete and attack the embedded rebar and the deterioration process escalates. A strategy that can be implemented to slow down the corrosion process is the use of penetrating corrosion inhibitors. A corrosion inhibitor, as defined by the American Concrete Institute, is "a liquid or powder that effectively decreases corrosion of reinforcing steel." In the case of existing concrete, a liquid amino alcohol-based corrosion inhibitor can be sprayed onto the surface of the concrete where it will penetrate through the hardened concrete down to the depth of the rebar. When the penetrating corrosion inhibitor reaches the rebar, it forms a protective layer around the steel. Such a method has been shown in independent laboratory tests to reduce corrosion in reinforced concrete by as much as 60 to 70%. This technology requires no special equipment and is easy to apply, making it ideal for plant maintenance crews. This type of corrosion inhibitor also may be used as an admixture to protect rebar in new concrete. Other common root causes of concrete deterioration in water and wastewater tanks are abrasion, chemical attack and freeze-thaw cycling. Abrasion damage results from the abrasive effects of waterborne silt, sand, gravel and other debris coming in contact with the concrete and causing the concrete to erode. Chemical attack can come in a variety of forms. One form occurs with the presence of acids and low pH water (less than 6.5). Water that is acidic dissolves the cement matrix that binds the aggregate in the concrete, causing the concrete to become weakened. Another form of chemical attack occurs when sulfates in the water or wastewater react with the tricalcium aluminate in cement to form the expansive compound ettringite. This expansion causes internal stresses that cause the concrete to crack or crumble. Additionally, the wet-dry cycling that takes place inside a tank between the high and low water marks accentuates the impact of sulfate attack on concrete. Freeze-thaw cycling in this zone also causes expansive forces within the concrete that result in cracking and spalling. Concrete can be protected from these root causes by preventing the contained water from coming in contact with the concrete. For obvious reasons, this may not be so easy to accomplish inside a water tank. However, it can be done with the use of protective coatings. When preparing a protective coating strategy it is usually necessary to differentiate between water and wastewater tanks since the latter contains water that is usually much more aggressive in terms of water chemistry and its affect on concrete. To protect concrete in potable water tanks, polymer-modified cementitious coatings have been used with much success. A polymer-modified cementitious coating can provide an extremely dense protective layer on the surface of concrete while at the same time providing a degree of flexibility. The flexibility of this coating is important because it allows hairline cracks to be sealed by the coating without having to detail every crack with sealant, chemical grout, or a strip and seal system. A good polymer-modified cementitious coating can bridge these small cracks and be flexible enough to withstand a small amount of crack movement from thermal expansion and contraction of the concrete. However, the quality of the polymer component of the coating is an important ingredient that dictates just how flexible and dense the coating will be. Acrylic and styrene-acrylic based polymers provide the desired properties. For tanks that contain wastewater, the chemical resistance of the coating is extremely important. For the coating to be successful in protecting the concrete, it must be resistant to the particular chemicals at certain concentrations in the contained wastewater. The best way to determine if a particular coating is resistant to the wastewater in question is through laboratory analysis. This option often is not economically feasible for the job at hand. When this is the case, the owner or engineer should ask for reference projects from the coating manufacturer (preferably projects with similar exposure conditions). For wastewater tanks, epoxy coatings offer a high degree of chemical resistance and ease of application. More specifically, the standard liquid bisphenol A epoxy with polyamine hardener has proven to be very durable in wastewater tanks. Other coating technologies such as polyureas, urethanes and vinyl esters also offer a high degree of chemical resistance but often are not easily applied. While epoxies generally have excellent chemical resistance and are user-friendly, they need to be applied under the right conditions. One of the most common problems occurs when epoxy coatings are applied on wet concrete. This condition generally happens with tanks that have been recently drained to permit repair and maintenance work to be done. Two moisture-related issues that need to be checked before applying an epoxy coating are moisture vapor transmission (outgassing) and excessive moisture content. Moisture vapor transmission. Moisture vapor transmission (outgassing) simply means that water in its gaseous form (moisture vapor) is trying to exit the concrete. Under the right conditions of temperature and humidity, moisture vapor can be drawn out of the concrete and into the atmosphere through evaporation. If you try to apply an epoxy coating (or any other "non-breathable" coating) on concrete that is experiencing outgassing, you could end up with blisters and pinholes, coating defects that do not provide any protection for the concrete. Additionally, these blisters and pinholes often lead to delamination of the coating that can affect a much larger area. There is a simple test that can be performed in checking for moisture vapor transmission. ASTM D 4263 (otherwise known as the "Mat Test") involves taping an 18 inch by 18 inch polyethylene sheet to the concrete surface and leaving it for a minimum of 16 hours. If after this time, moisture vapor droplets or condensation appear on the underside of the plastic sheet, then outgassing is occurring. Do not attempt to apply the epoxy coating if outgassing is happening. The solution may be as simple as waiting until late in the afternoon or night to apply the coating when the sun is not drawing the water vapor out of the concrete. If outgassing continues to occur even at night, the solution can be the same as that used to solve the second moisture-related problem, that of excessive moisture content as outlined below. Excessive moisture content. It is a general rule-of-thumb that you should not apply an epoxy coating on a concrete surface that has a moisture content greater than four percent. If the moisture content is greater than four percent, the moisture in the pores of the concrete can prevent the epoxy from bonding well to the concrete. Likewise, it is not advisable to apply an epoxy coating on new concrete until it is at least 28 days old, so that the concrete has a chance to hydrate and the moisture content has a chance to drop. The moisture content of concrete should be checked using a moisture meter every 500­p;1,000 square foot of surface area to be coated. If the concrete has a moisture content greater than four percent, the easiest solution is to let the concrete dry to less than four percent. Depending on temperature and humidity, it may take a considerable amount of time for this to happen, especially if the tank has been in service for many years and in constant contact with water. This may not be an acceptable solution due to limitations on the time that the tank can be out of service. In the case of new construction, you may not have the luxury of waiting 28 days for new concrete to cure if the tank needs to be put on-line as soon as possible. In these cases, a solution to the moisture problem is to apply a special formulation of an epoxy-cement mortar (water-based epoxy resin + cement) on the concrete surface before the application of the epoxy coating. The cement component of the epoxy-cement mixture allows the mortar to bond to a wet concrete substrate (up to 12% moisture content). Applied as a leveling mortar, this thin epoxy-cement mortar layer will act as a temporary moisture barrier on the surface of the concrete long enough to allow the epoxy coating to achieve an adequate bond. There are commercial blends available that incorporate the two component water-based epoxy and the sand/cement component in one package. In addition to solving the moisture problem, the cement-epoxy mortar layer also fills in bugholes, honeycombs and pores on the surface of the concrete. These surface defects make it almost impossible to obtain a continuous protective coating at the proper thickness on the concrete surface. By leveling the surface prior to applying the coating, it becomes possible to cover every square inch of surface area at the required thickness with the protective coating. Finally, the epoxy protective coating is applied to all surfaces at the manufacturer's recommended thickness. According to the EPA and other industry sources, the U.S. municipal water and wastewater industry needs to invest $260 billion in capital expenditures over the next 20 years to keep up with expected demand and meet new and existing federal regulations. Much of the money needed is for the rehabilitation of existing water and wastewater treatment plants that have suffered from neglect due to the unavailability of funds. Hopefully, funds will be made available to bring our water and wastewater systems up to speed. If and when that happens, protecting concrete tanks from the aggressive influences of the water or wastewater it contains should be a top priority. Whether the concrete is new or existing, the life cycle of the concrete can be extended significantly by taking the appropriate steps to protect the concrete. Greg Illig is the market field manager-civil engineering for Sika Corporation, Lyndhurst, New Jersey. He is a voting member of ACI Committees 503 Adhesives and 210 Deterioration of Concrete in Hydraulic Structures. He also is a member of ASCE's Pipeline Infrastructure Committee and a member of WEF and AWWA.